What scares people at this Niagara Falls haunted house attraction? The following are frequently asked questions asked by the many thrill-seeking tourists, daring to visit Nightmares Fear Factory. Can I take my dog inside? Is it a ride or walk through? You walk through the attraction solely with the group you attend with at your own speed led by a trail of red lights. 6 people is the maximum group size. Nightmares recommends groups of 4 people. Can I take my children inside? Can we join groups with others? It is Nightmares policy to only let family/friends enter together. Nightmares isn’t like other haunted houses, and the experience is more personal for some people. When you are going through the haunted house you have to stay together and be holding on to each other. People do not want strangers holding onto them and grabbing onto them in a scared fit. Also for safety and security reasons we DO NOT send strangers in together. Depending on your own pace generally it takes 10-15 minutes, however some people may not even make it to 10 seconds. Nightmares is the scariest haunted house in Niagara Falls, and once you purchase a ticket there are no refunds. Can I take pictures or record while going through? No photos or recording is permitted inside of Nightmares. Nightmares will not be responsible for damage to any cameras or cell phones. Its best to leave them in a safe and secure place. If at any time during your experience you choose not to continue you just stop and scream "NIGHTMARES" and something will come to take you out. You are then added to our chicken list which is now over 155,000 and growing! Nightmares is Niagara's scariest attraction. Everyone is different. Nightmares is geared towards adults, however we do let children enter. Nightmares is a safe, fun attraction and has won Trip Advisors certificate of excellence 4 years in a row. It is very difficult for us to judge how scared YOU will get, but this is one attraction you don't want to miss. We're open daily at 11am. Closing time varies depending on the season. It's always best to call or Email us to confirm. Our phone number is 905.357.FEAR (3327). Visit the hours page for more info. Does Nightmares take pictures or videos while I go through? Nightmares does take photos of you going through. You can purchase them once you exit for $8.00. Nightmares does not take videos that you can purchase while you go through. Get your photo and show your friends just how scared you get. We have special rates for groups of 15 or more. We also have special student group rates for pre-booked groups or walk-in's. Contact us for more details. Is Nightmares in Canada or USA? 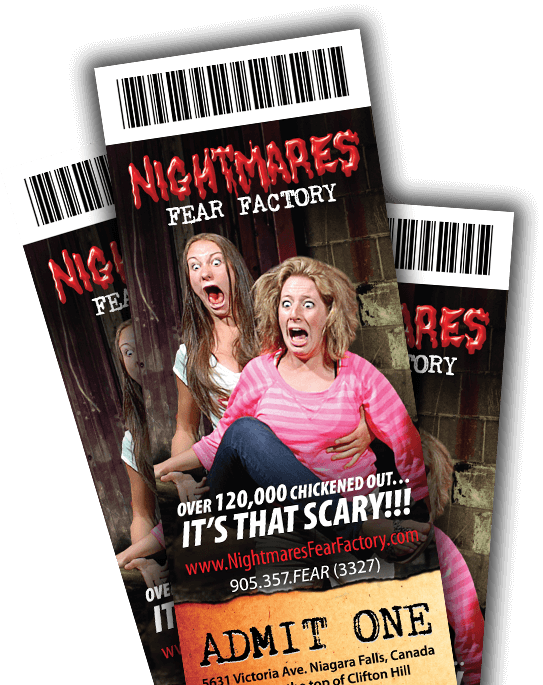 Nightmares Fear Factory is located in Canada. If you are visiting from outside of Canada, please visit http://www.cic.gc.ca/english/visit/apply-who.asp to ensure you meet Canadian entry requirements. Are you located on Clifton Hill? Is it live actors or displays? Due to the nature of the maze in the haunted factory, it is not wheelchair accessible. We apologize for any inconvenience. Due to the nature of the haunted house anyone who has difficulty walking, requires assistance in walking, has had a recent injury or surgery cannot enter Nightmares. The safety of our customer's is very important to us. What if I'm pregnant or suffer from a heart condition? If you are pregnant or suffer from a heart condition DO NOT GO IN! Absolutely no refunds. Do they touch you or separate you in there? No comment! Sorry no flashlights allowed either! What do the people see that makes them so scared? It's not just one "thing". There are multiple scares throughout the entire maze - and changes are made regularly. Come find out for yourself... if you DARE! Do you offer REFUNDS if I change my mind or chicken out? Absolutely no refunds are available. Tickets can be used at anytime, unless otherwise noted.